The Fund is an actively managed ETF of ETFs, holding a diverse portfolio of primarily passive index-based ETFs, also utilizing actively managed ETFs when the Fund’s management believes it advantageous. A cost-effective alternative to the traditional OCIO model. The Fund integrates the cost advantages of an ETF structure with the experienced professional management, research and analytics of the traditional Outsourced Chief Investment Officer. Active management where it is likely to deliver the most value. OCIO ETF’s managers focus on the asset allocation and fund selection within target allocations, where we believe active management has the greatest potential to improve long-term performance. A potential core- or total-portfolio solution. Fees and minimums may be substantially lower than with other outsourced arrangements. OCIO ETF also has the potential to be much less costly and cumbersome than building a portfolio of individual securities or ETFs in-house. Independent, ETF-neutral. 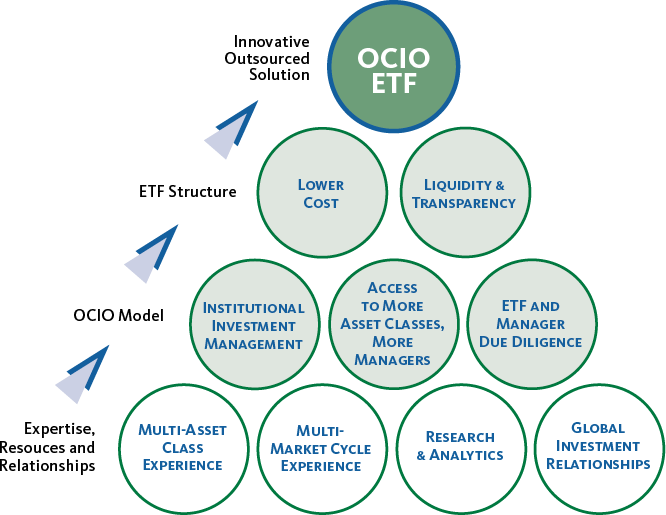 OCIO ETF is independent, with no bias toward in-house or any other ETF provider. Disciplined risk management. Risk analysis and position limits are embedded in our investment process, and the Fund does not invest in ETFs employing high levels of leverage, derivatives or highly illiquid securities. 1 Top-down, forward-looking capital market research: The OCIO ETF process utilizes forward-looking, top-down macroeconomic research and analysis to isolate forward-skewed opportunities. Our analysis also evaluates global economic scenarios by probability of occurrence, and seeks to identify the markets, asset classes, sectors, styles and geographic regions we believe are best positioned to deliver positive absolute and relative returns. 2 Risk analysis: We also seek to identify markets, asset classes, sectors, styles and geographic regions at risk – those that may encounter negative headwinds over the next 3-12 months. Among the factors included in our analysis are credit spread levels, market volatility, yield curve shape, energy prices, market correlations and currency risks. 3 Bottom-up research: Our bottom-up research seeks to identify asset classes that are attractive on both an absolute and relative basis, and to select optimal ETFs using equities-, fixed income- and alternative investments-specific criteria. 4 Active asset allocation: OCIO ETF seeks to generate active alpha by outperforming a blended benchmark of 60% MSCI ACWI/40% Bloomberg Barclays U.S. Aggregate Bond Index, through over- and under-allocation weights for asset classes, geographic regions, sectors and investment styles. The Fund’s Investment Committee sets ongoing allocations based on its assessment of opportunities and risks at the global macroeconomic level. Disciplined risk management. We know that limiting downside risk can be just as important for long-term performance as capturing upside movement. In addition to the disciplined risk analysis embedded in our investment process, the Fund does not invest in ETFs that employ high levels of leverage, derivatives, or highly illiquid securities. OCIO ETF typically limits investment in any single ETF to a maximum of 5% of total assets. We do not anticipate using leverage at the Fund level. The Bloomberg US Barclays Aggregate Bond Index is a market value-weighted index that tracks the daily price, coupon, pay-downs, and total return performance of fixed-rate, publicly placed, dollar-denominated, and non- convertible investment grade debt issues with at least $250 million par amount outstanding and with at least one year to final maturity.